I am a lover-of-buntings. They are simple, lovely, versatile, and classic. You can use a bunting to decorate for literally any occasion – holidays, birthdays, parties…indoor or outdoor…formal or informal…with lettering or without…paper or fabric…so many possibilities! So it got me to thinking…what if there was a way to make all of those buntings in one? I could create bunting flags out of a bunch of different colors and prints of fabric to be able to mix and match depending on the holiday or occasion! Now, I am NOT a sewer. I really hope to learn someday (I do have a machine and know the very basics), but even a simple project like sewing fabric triangles would have taken me a loooong time. I made a scrapbook paper bunting for my daughter’s first birthday which was great for a one-time-use thing, but I wanted something more substantial. So, I decided to attempt my very first Silhouette fabric project! 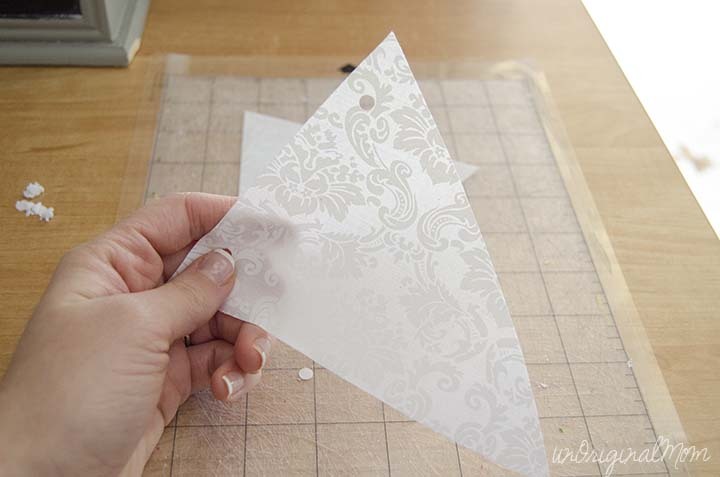 First, I created a cut file in Silhouette studio – just a simple triangle with two holes for stringing. I put two triangles together into a parallelogram (yes, I know my shapes!) for the most efficient use of fabric when cutting. Would you like to have the cut file? I’d love to share! Here it is! I cut a parallelogram equal to the size of my two triangles onto cardstock to use as a measuring guide. After cutting the fabric into rectangles, I cut the Silhouette Clean-Cut interfacing into slightly smaller rectangles and ironed it onto the back side of the fabric. The next step is to trim the excess fabric from the edges, and finally to peel the paper backing off of the interfacing. Apply the fabric – interfacing down – onto the mat. 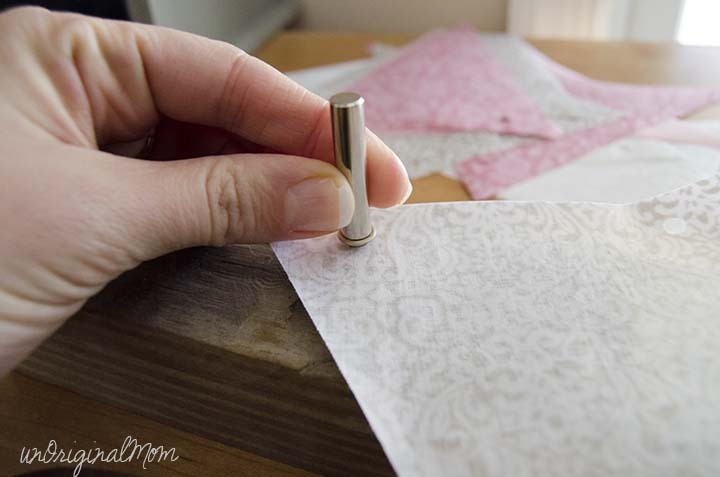 A few things to keep in mind – be sure the fabric isn’t in the way of the rollers or else they will wrinkle and bunch up the edges of the fabric. Also I made the mistake of using a relatively new mat at first, and it actually held onto the interfacing when I tried to peel up the fabric. I switched to an older, less sticky mat after that and had no problems. 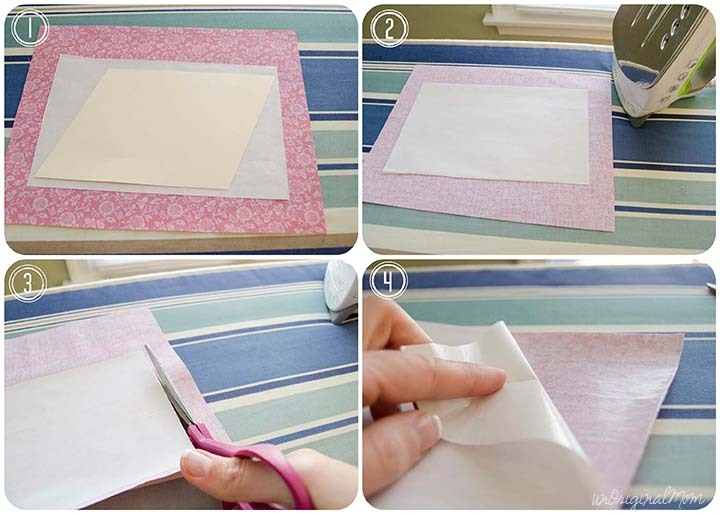 Just like you have fabric scissors you keep separate in order to keep them sharp, you need a fabric blade to dedicate exclusively to fabric – cutting paper even once or twice will make it too dull to cut fabric well. Silhouette makes a fabric blade, but it’s really just a regular blade in a blue casing to make it look different. If you have a brand new blade, you can use that for fabric – just use nail polish or something to label it as your fabric blade so you can tell it apart from your other blade(s). Because I want these bunting triangles to hold up for a while, I added eyelets (also known as rivets) to the holes. If you’re using my cut file, you’ll need 3/16″ eyelets (or you’ll need to adjust the holes to the size of your eyelets.) Notice that you can’t just buy the eyelets – you also need an eyelet tool kit of the corresponding size to set them. It gives you a nice, finished look to your bunting triangles! Plus, they’ll hold up much better to being used and re-used many times. Take your finished triangles and string them together to make your bunting! I used red & white bakers twine, but you could use yarn, ribbon, rickrack, jute twine, or anything else you have laying around! Hey, wait! You thought that was it? Not even close! 43 (yes, forty-three!!) 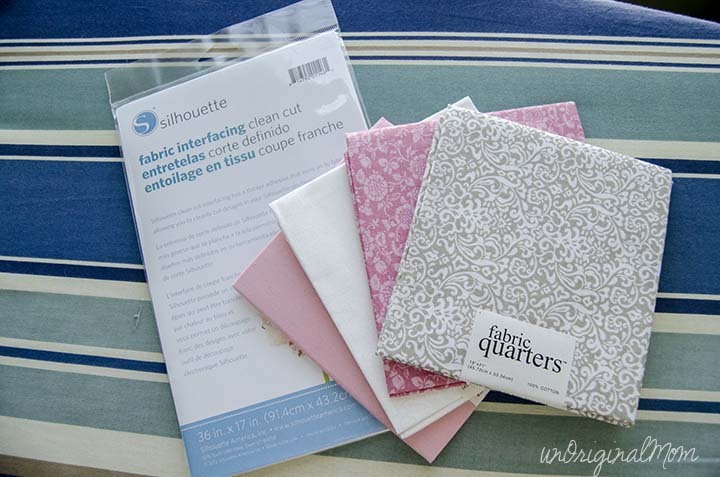 of my bloggy friends are also sharing fabric projects for your Silhouette today! Pace yourself, because you are definitely going to want to make it the whole way through this impressive list. As a member of the Silhouette Challenge Support Team, I am helping to “test drive” a new concept for our monthly graphic…you can click directly on a specific thumbnail photo within the larger image below to take you to the project you’d like to see – OR scroll down to see a list of the participating blogs with their corresponding photo number! What’s the next fabric project YOU will be attempting? Did you get any great ideas? I hope so…I know I did! Your fabric bunting is adorable!!! I love the fabrics you used on it! Hi. I am from the Silhouette FB group and am #29 in the project list. I love your banner and it can be used for any occasion! I’m pinning for later use! Thanks for sharing. Oh wow eyelets!! I never would’ve thought of that.. but boy does it make for a nice finished product!! And I love that you used fabric quarters, good thinking! 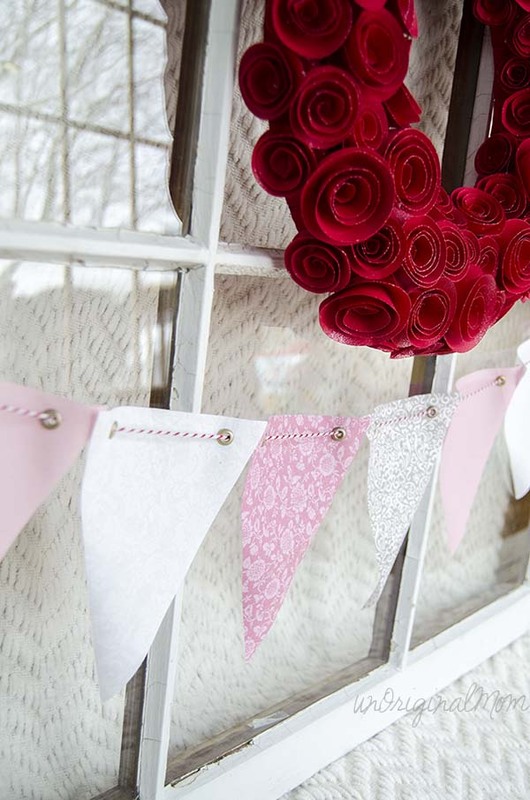 The bunting looks fabulous, as does the whole of your mantel! The eyelets are a great idea for the bunting. Great idea! I’m going to try cutting fabric soon. Thanks for the cut file. Very cute banner! I haven’t cut any fabric yet, but maybe after this I will. Super cute! I bought that interfacing months ago and this might just be the excuse to pull it out! Love the bunting and love the idea of switching it out! I do this other things and love the versatality and usefulness of it! Gorgeous display and decor too! Your mantle is gorgeous! 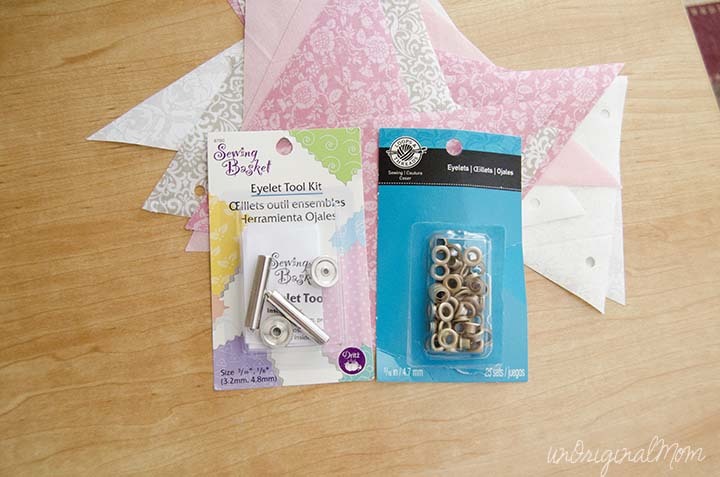 I love your bunting and the eyelets give it such a great look! Well done!! 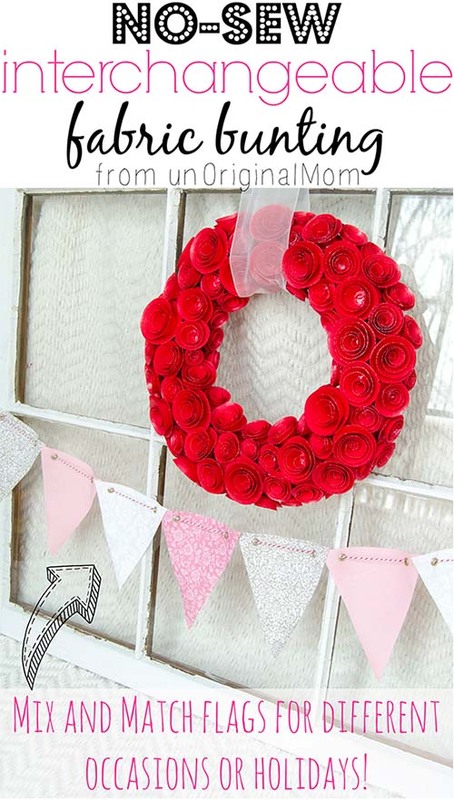 Your bunting looks so great with that gorgeous wreath! I like the idea of how you’re going to use pennants to mix and match for other holidays throughout the year. Such a great idea! I’m so glad that the FB Silhouette Challenge group did fabric this month. I’m new to the Silhouette world and haven’t been brave enough to try cutting fabric yet, but you guys are inspiring me to give it a try! I’m going to pin this to my Silhouette board. This is so cute! I love that you used grommets! This is very cute, I love buntings. I like how you added the grommets. I also LOVE that wreath! Meredith, that is amazing! I love it! 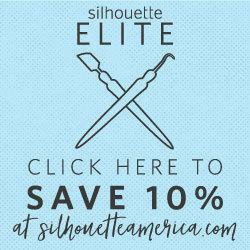 I so want to cut fabric with my Silhouette! I LOVE this! I definitely need some new decorations in my home. Might just be trying this! It’s me again! I am just stopping by to let you know that I am featuring this on Do Tell Tuesday!! :D Thanks for linking up. LOVE the grommets! 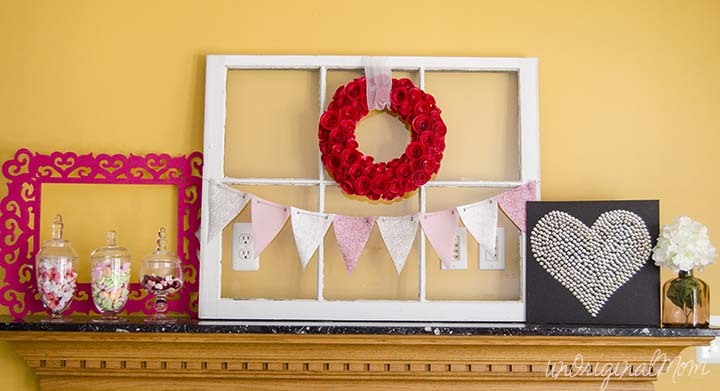 Your mantle is adorable too…so many fun pieces! Great project for those who don’t sew – and even those who do! I can imagine using these buntings for lots of different events – holidays, birthdays, and family/religious celebrations! Thanks Deanna! It’s great to have the flexibility to swap out with the change of seasons or for parties/get-togethers! I LOVE the idea of interchangeable buntings! I think I might end up with way too many pieces of fabric though. So many pretty fabrics…. Hi Kristen! Any kind of no-sew iron-on interfacing from the fabric store should work! It just needs to stabilize the fabric enough for the blade to be able to cut it. I’ve also read that you can overly starch the fabric to make it very stiff, and then the Silhouette will cut it. Hope that helps! Hi Meredith! I absolutely love the idea of making the bunting reusable. I bought the supplies to make one today! I will post it soon and of course link back to your fabulous blog. Thanks! Love this, the grommets are such a smart idea! Stopping by to pin this and let you know I featured it on my blog today! I’ve been obsessed with grommets of late, so it’s fun to see you incorporating them so seamlessly into this project – – it totally empowers me to give ’em a try! 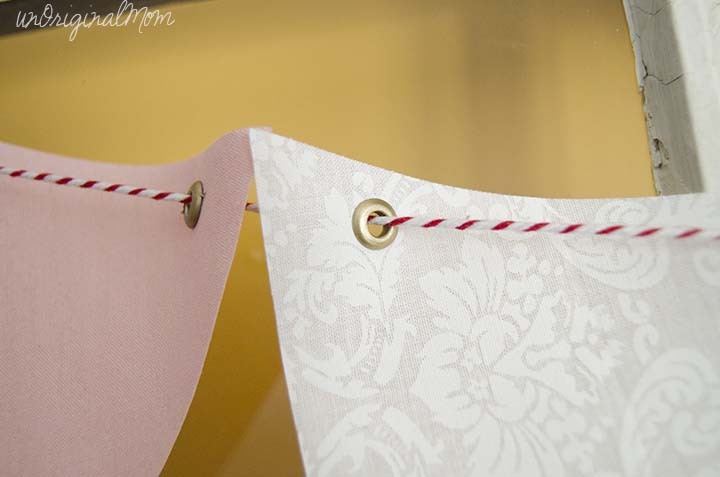 And the fact that they help make your bunting interchangeable, well, that’s sheer genius. Virtual high five to you!